Places to stay in Saltburn by the Sea. Welcome to 'Places to Stay' in Saltburn by the Sea. Our easy-to-use guide is designed to help you to search for a great place to stay in a wide variety of accommodation for business or pleasure in bed and breakfast, luxury hotels and self catering apartment accommodation in Saltburn and the local area. Please note that this list is provided as a courtesy service and we are unable to provide brochures related to any of the accommodations listed. Saltburn Tourist Information Centre should be contacted directly on 01287 622422 if you require any further information related to accommodation availablility in Saltburn. Garden Flat 13b Marine Parade, Saltburn. Contact June Hume 07815839996. Lune Street House with a private room. Visit Airbnb for details. Cambridge Street House with a private room. Visit Airbnb for details. Emerald Street House with a private room. Visit for details. Alpha Apartment, 17 Station Street, Saltburn-by-the-Sea, Cleveland, TS12 1AE Tel:07584325178 The apartment sleeps 2-9 people and has 5 bathrooms, 5 bedrooms and 3 sitting areas. Visit the website. Alpha Apartment can also be found on Facebook. The Outlook, contact: 01947 840683 or 07977 447 634 Visit the website. Also available alongside the Outlook (see contact details above) is Treetops, The Mary Martin Building, Glenside, Saltburn by the Sea. Saltburn Holiday Apartment 27 Marine Parade, Saltburn-by-the-Sea, Contact Martin Binks on 07768740585 Saltburn Holiday Home apartment is situated on Marine Parade boasting fantastic sea views overlooking Saltburn's Pier and Cliff Lift. This first floor, two bedroomed apartment is ideally suited for couples with up to two children. Visit the Salburn Holiday Home website where full details can be found. 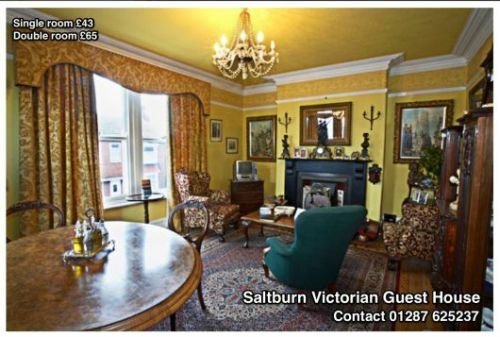 Contact:07969 280499, or visit Saltburn Victoria Apartments website. Brockley Hall Hotel, Glenside, Saltburn, TS12 1JS 01287 622179. Spa Hotel, Saltburn Bank, Saltburn TS12 1HH 01287 622544. All basic listings are free and include establishment, address, and telephone number. Not listed? Simply fill in our contact form and send us your details. Incorrect listing - just let us know of the changes we need to make. If you offer good quality bed and breakfast, self catering or luxury hotel accommodation in the Saltburn by the Sea area and would like to advertise on this web site please get in touch for further information. Our basic listings are free. You can add an e-mail and/or web link for a one time fee of £10. Please use our contact form if you would like more details on additional advertising.